We browsed an art show in Cocoa Beach Saturday afternoon, and then that evening attended the pre-race pasta dinner with over 1,000 other runners. There were two speakers at the dinner: Olympic gold medalist marathoner Joan Benoit something, and an astronaut who spoke about how running a marathon is like a space shuttle mission. During the dinner, most of the runners wore trophy shirts from previous marathons and/or triathalons. Gina later commented on the incredible amount of raw ego present in the room. Indeed, everyone seemed to be strutting. You can manually review the entire Flickr photoset available here. Berkely “Gulp” fishing bait, shrimp or minnows. acappella music CD’s, go to http://www.a-cappella.com/ and look for basix and blue jupiter. kayak paddle leash, a critical safety item that I don’t have. Some of these items, and some books and CD’s, are on my Amazon wishlist. The St. Pete Times reports on an accident last weekend wherein the pilot of a 35′ high speed sport boat was ejected at 90 mph. The boat continued on for a mile until it plowed across a sand key and then burrowed into shallow water.Â The driver was hurt, but not seriously.Â Geez, what if this had been in a populated area? Thanks Capt. Bob J. for the news tip. 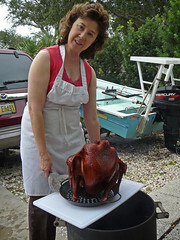 Author baribobPosted on November 28, 2007 Categories current events, recreationLeave a comment on wish I’d seen that! I still have photos from race day in my camera and haven’t found time to review yet, but I just received email notice that the commercial service has posted some race day pictures for purchase. The thumbnails are pretty crappy, and nothing larger can be extracted from the site. more later. I can’t find Gina’s photos without her bib number, which I don’t have and can’t read from the thumbnail. 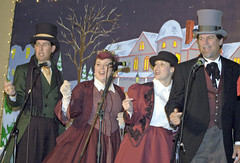 I invited two caroling ladies to drop in on the Orange Blossom Chorus rehearsal last night. With Seth, we presented a short holiday set, it went nicely and the guys seemed to like it. Fellow barbershopper and first-year caroler Dean Dix also joined us for a couple of songs. Gina and I completed the Spacecoast half marathon this morning….we are both quite sore, and I’m hoping my left knee is not injured. Update: Here’s a bar graph of my weekly training over the last few months, culminating in this last week with a 5k on thanksgiving day, and the 13 miler on Sunday. The two gaps in the record reflect vacation time, first in Georgia last summer, and then a fishing vacation this past October. The graph is from a log I’ve kept in a google spreadsheet document.� I going to take this week off from running. Photos from the half marathon still to come! 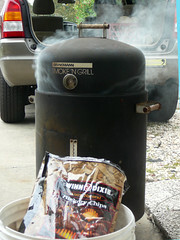 I broke out the charcoal and smoker for this thanksgiving. 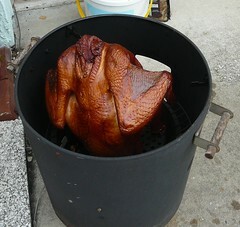 Tended it for about 4.5 hours, and result was one golden brown bird. It was quite tasty, although a little underdone. No one complained and no one got sick. The holiday went just fine, with participation by parents and inlaws.